Did you ever live with a piece of furniture that you really don't like for a very long time and then all of a sudden...on a whim...you want to transform it. Well, that's the story of a coffee table in our family room. When my parents moved in with us, they had 50 years worth of furniture that they had collected while traveling the world with the army. My mom was also a yard saler/thrifter and loved her deals. They had several teak dining room tables that they bought while thrifting years ago. This table was one of them. However, we didn't need a dining room or kitchen table, so a few years ago I switched out the legs of the dining table for the legs of a coffee table. It works great as a coffee table...large enough for all our family gatherings and parties. The thing I hated the most...my dad varnished the crap out of it. Sorry about that, but I couldn't explain it any other way. The wood was so shiny, you need sunglasses if the light hit it. Ok, maybe not that shiny, but not the natural wood look that I like. What are my quickest options...sanding (no), chemical striping (no), painting (no) because that would require sanding and priming. What's the answer...MOD PODGE and an old dictionary! Here is the semi before. Forgot to take a full picture of the table before I started gluing. Guess when I started this project...the day before Thanksgiving, when we were having 25+ for dinner. I told you it was a whim. Looks good, but needed to dry to get the full effect. and here it was all set for Thanksgiving, just a few hours after I started. What do you call your TV remotes? 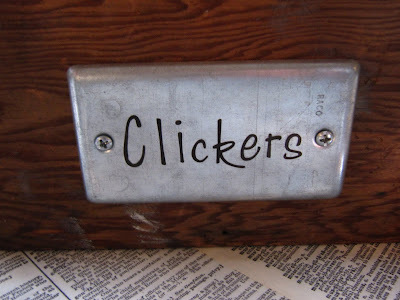 We call them clickers and we have a box of them...tv, dvd, vcr, wii. Here it is all set for Christmas. For last weekend's party, it was covered with food and drinks and held up perfectly. We have another party this weekend, so I'll let you know. I always put a wreath on the table...it adds some color and when we have a party, I add a pedestal plate for appetizers or a punch bowl for egg nog in the center of the wreath. 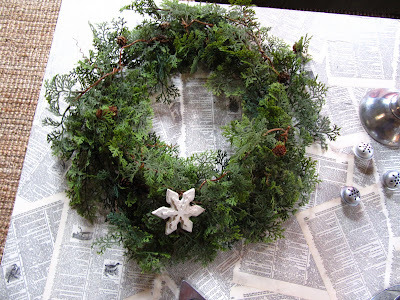 I had mentioned before I am a clearance woman...I bought 4 of these wreaths at a gift shop for $1.00 each...woo hoo!! Here's the link to the Tool Time tutorial where I made these boxes. More ideas over at that post, so don't miss it! That galvanized plate is a switch plate from the electrical section in the ( where else) the hardware store! When I was tearing out pages, I made sure (thanks to Courtney) to pick a few words that had meaning to our family. The girls danced their whole life together and Kelsie is still dancing at college. Courtney is a graphic design major. Courtney's boyfriend Courtland loves every thing to do with music. 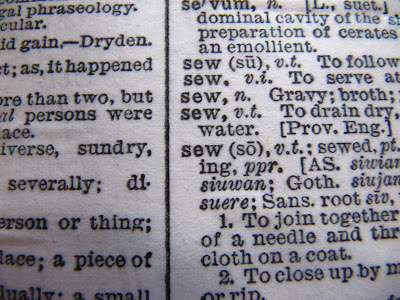 and mine is sewing...I love to sew, but if they had the word blogging in this 1952 dictionary, I would have ripped it out and glued it right in the center! Our last name is in the dictionary, so that's fun to have that on there too. Remember when you are using Mod Podge...brush on a coat of glue, add your paper and then add another layer of glue right on top of that. Once it dries, the top coat acts as a sealer to protect the paper. spaceHope you can give this a try. 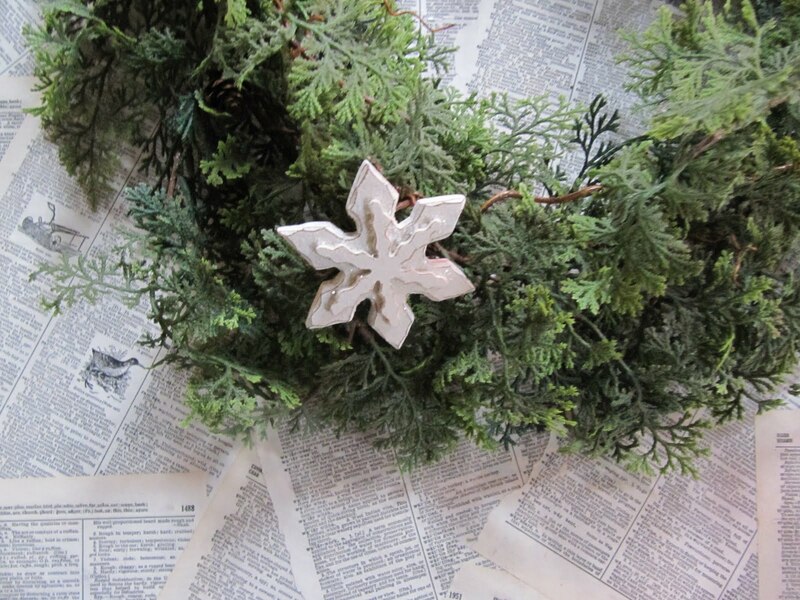 You can use any paper...scrap booking, old books, copies of photos etc. If you want to do a smaller project, try a tray or side table to start. 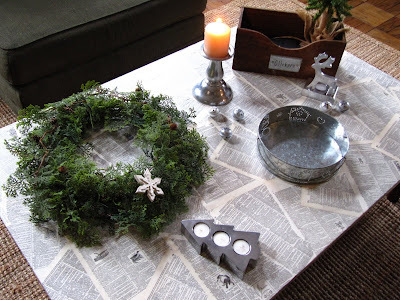 I'm sharing this post at It's a Hodgepodge Friday...come join the fun! 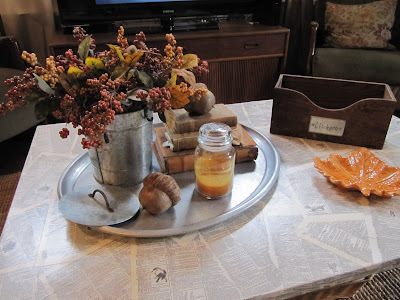 Also sharing at Just A Girl and Tatertots and Jello and Funky Junk Interiors. OMG You never cease to amaze me - Love it !! This is so cool looking I am going to do this on a table I have. What a great I-spy conversation piece!! I really love this!! wonderful idea and a beautiful table! O love this great idea of yours!! 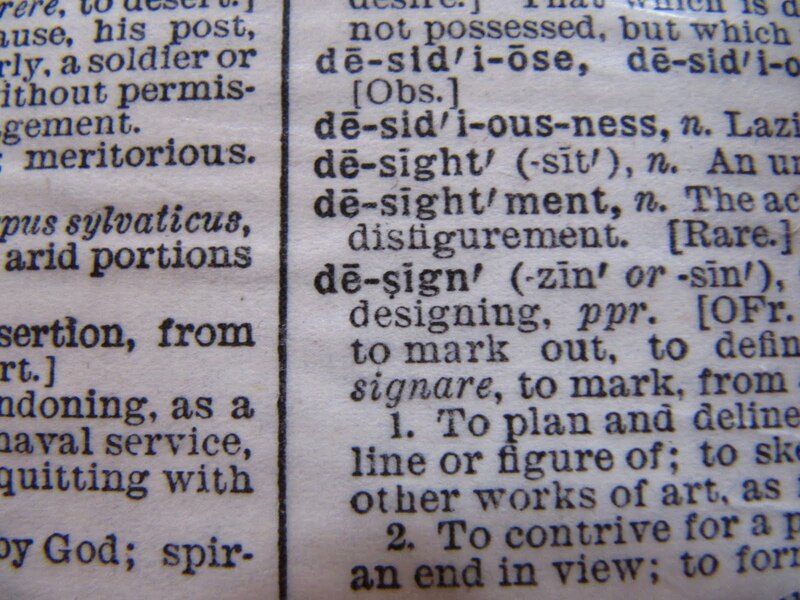 Maybe I will copy this idea with a French dictionary. Than I can improve my language on the same time as drinking a little glass of Burgundy wine. 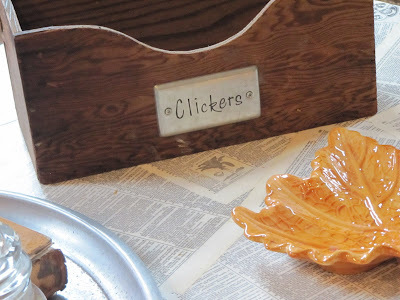 I completely missed that at the party, but I did catch a glimpse of it in your cookie post at Pleasant Home. I wondered what book it was. Very cool! I wish I was brave enough to try something like this!!!! 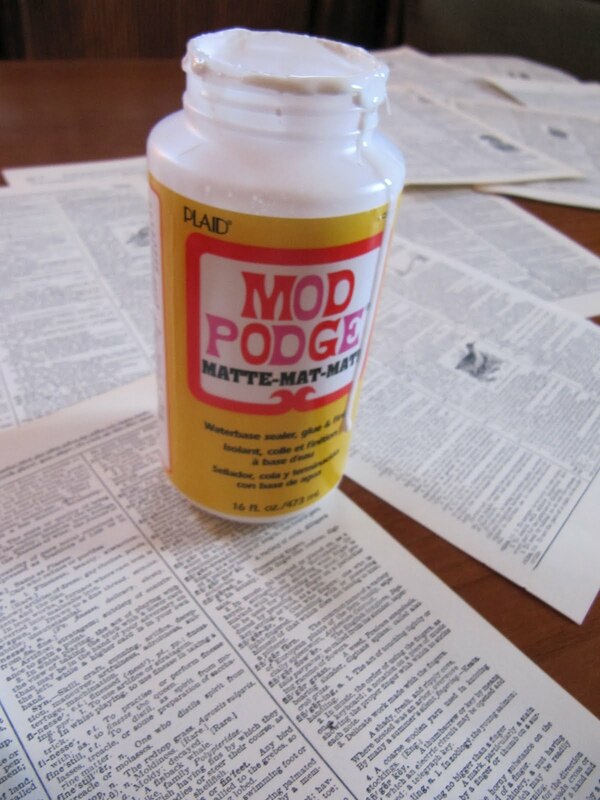 I know mod podge is like your best friend. What is it exactly?? Is it glue, maybe carpenter style glue???? Or sealer? What does it say on the bottle?? I am sure after a party you use a wet cloth to clean it, right?? Does the table stay ok after a while??? Sorry, I have so many questions!!!! But looks great, maybe I´ll try something like that!! haha!! I´ll let you know!! The words Artistic, Beautiful, Creative, Decorative, Elegant, Funloving, Generative, Hardware-store, Imaginative, Joyful, Keen, Lovely, Modify, Notions, Organized, Purpose, Quizzical, Re-purpose, Suggestions, Transformations, Utilize, Visualization, Witty, Xmas, Youthfulness, Zealous all come to my mind when I think of your table. I agree with everything everyone has said about you!!!!!!! Have a wonderful holiday season! Amazing! 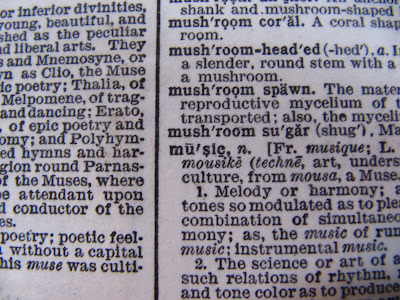 I love that you picked out words that had a connection with your family. Your decor ideas are awesome as always!! Love the wreath idea and the clicker box. I love the idea of modge podging the table ... I never would have thought of that. And I especially like that you took the time to add pages that had words that connected to your family. What a keepsake! We have a basket that we are supposed to keep our remotes (we call them clickers, too ha!). But we never seem to remember to put them in there! I love the box you made for yours. OMGosh I just love it....what a transformation! You have done it again! Have you ever thought of publishing a book? You have such great ideas! And they are so well explained with good pictures. 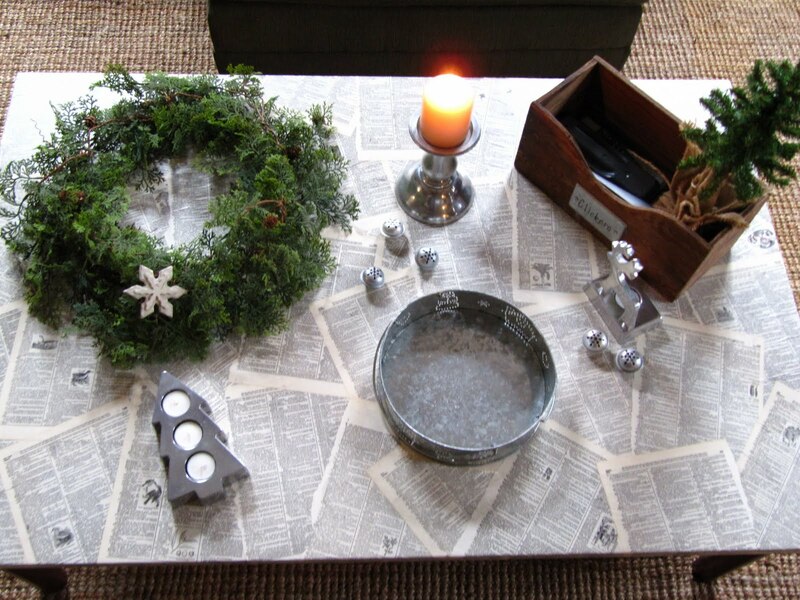 What a fantastic idea, I love the look of your coffee table. 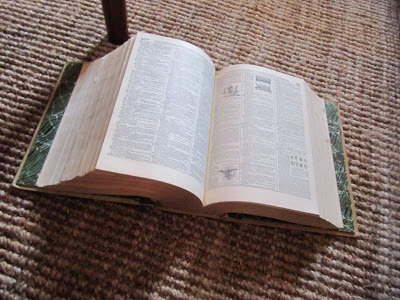 I don't know if I would have the heart to tear pages from a book (that's how crazy I am about books, even a 1952 dictionary), but I do have a little table that would look so much better all dressed up like this. Thanks for sharing, and I do agree with Simone, you should think of writing your own book. I love it, it looks like something you might see at Pottery Barn or Crate and Barrel. I think you missed your calling. I wish I had the courage to do something like that with furniture. Maybe I'll start with my daughter's old and battered nightstand. Thanks for sharing and Merry Christmas! Looked awful half way finished but looks great after all said and done. I wonder if there is something clear to paint over things that holds up to outdoor weather. Guessing ModPodge would melt if rained on. Very cool...we used to make pictures on wood out of magazine pages to decorate our room when I was a teen back in the early 70's, but this is way cooler! What you have original ideas, always manages to surprise. OMG!!! I LOVE LOVE LOVE THIS IDEA! I've seen tables in thrift shops that I wouldn't get because of their condition. Doing something like this would make them beautiful! Thanks again, for a wonderful idea! What a great idea. I love how you started it the day before Thanksgiving. That sounds like something I would do! What a great way to bring new life to an old table! Sheet music would be nice too! What a great idea of how to use the words in a dictionary that have real meaning for your family. I love me some Mod Podge!!!! I just used book pages to cover a canvas and then drew bird silouettes on them! Great table!!! 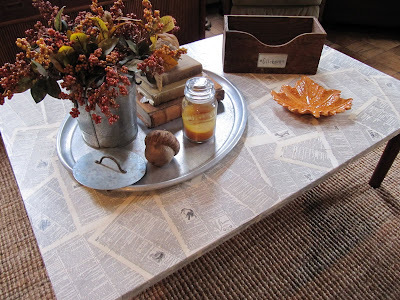 I decoupaged a coffee table a couple of years ago. Tranforms those ugly monsters! You did a phenomenal job! 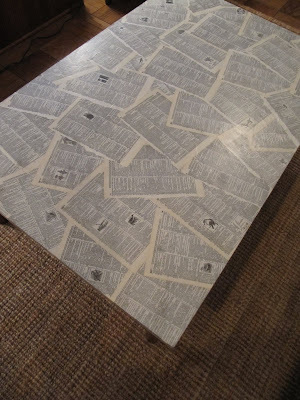 I LOVE decoupage! Wow, I call that table INSPIRED! 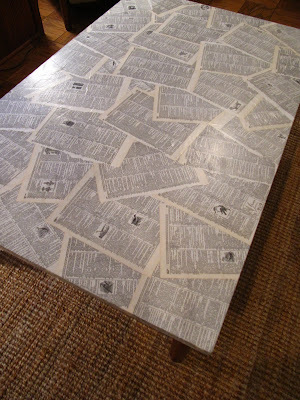 I might have to borrow that idea for a little table we have in our foyer for the mail. Your table is amazing! I would never have envisioned the outcome. We call our remotes "controllers" for some weird reason. The remote locks for our car doors are "clickers"! 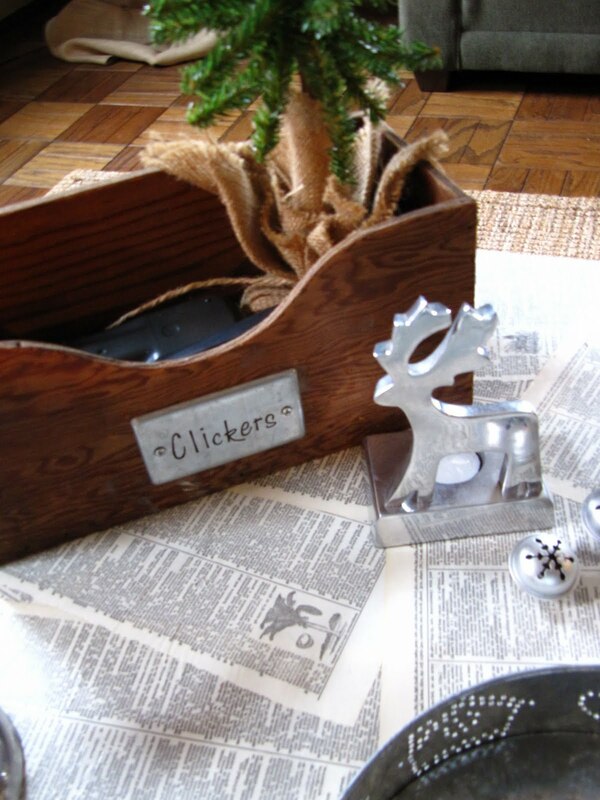 I don't have a table to try it on, but I do have a few wooden thrift store trays....and I am thinking of finding copies of my favorite books to tear the pages from---fab idea!! Wow! It turned out GREAT! I love it!!! I was laughing when you said your girls asked if daddy will like it. My kids always say, "does daddy know you are doing this"? Love it! I'm going to do mine with a Shakepseare theme. Maybe this break! Your table still " Shines so bright you need sunglasses," only in a wonderfully different kind of way. Great job! It looks fabulous! That it so cool! Have to try it since I used old book pages to make my Christmas cards. Your table is beautiful and interesting! I'm in awe of this...and you. I love it! :D It looks absolutely wonderful!!!!!!!!!!!!!!!! How brilliant is that? I love it! Fun! What a fun project for a table! 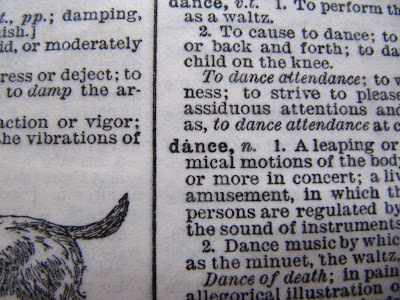 It sounds like you guys are party animals! Ha! Merry Christmas! That's so fun! I think I might have to do something fun like this to my coffee table. I keep thinking it needs some love. I've had it for a long time and it doesn't really match the rest of our living room anyway. I love this table! 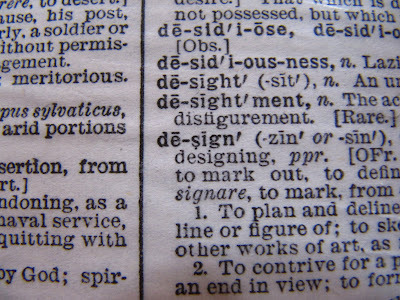 As an English major, your use of dictionary pages spoke directly to my heart and soul! 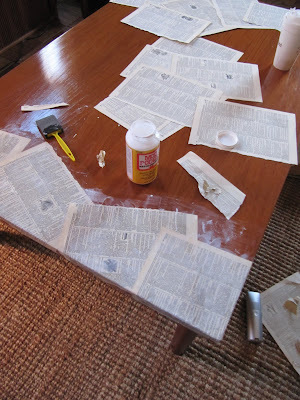 I've never used Mod Podge glue before, but I am now willing to experiment! Thank you for sharing and your pictures are gorgeous!!!!! I am bookmarking this post as a "thing I must do." Great idea for using the smaller legs and having a large enough piece for entertaining. 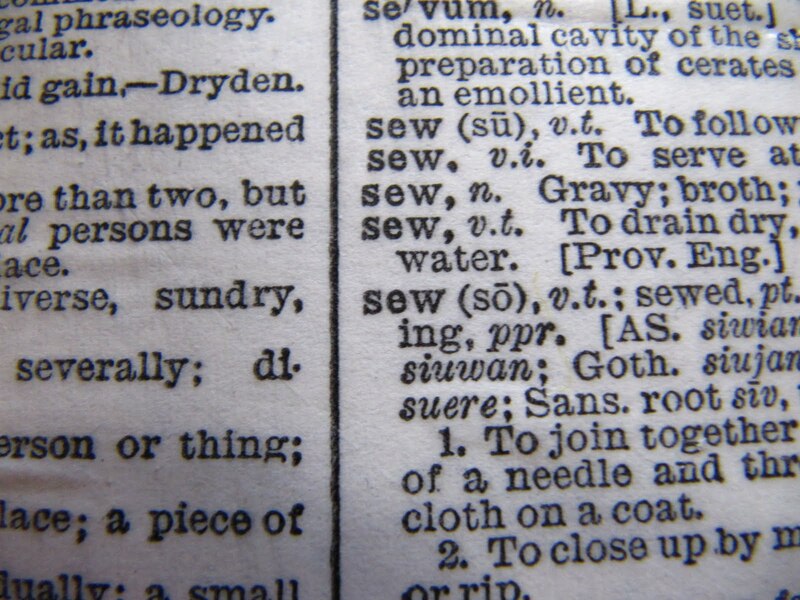 The dictionary words that are special to your family are such a wonderful touch. 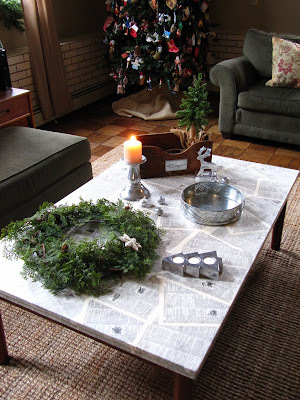 Love the pictures of the table dressed for the Thanksgiving and Christmas parties. it and then coated over them. I LOVE this and just recently received my childhood furniture and thought this would be a great idea for the top of the desk...I started and noticed some bubbling so I pulled it up real quick and thought I would ask you if the bubbling is normal or not. Will it go away once it dries or does it stay bubbled? Now this is one "cool" idea...looks outsatnding. I’m having a GIVEAWAY…would love to have you come by and enter to win a gift card and some goodies! 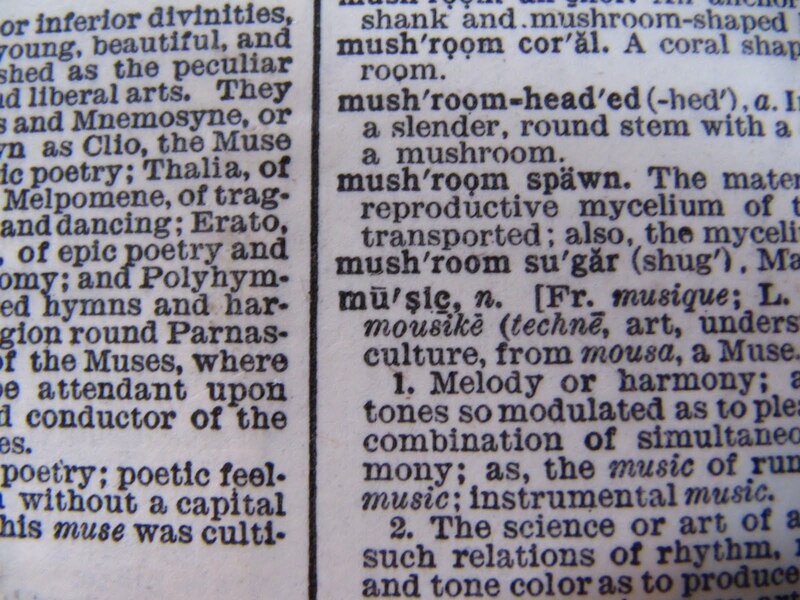 Love the table of words! We call ours "clickers" too! Blessings to your girls in college! Great table project. I have a few I think could use this treatment. 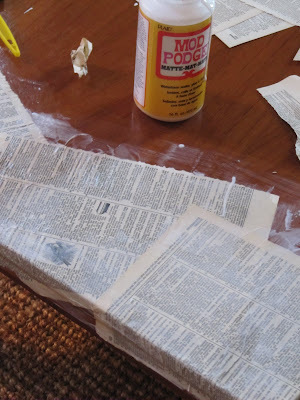 I have done a lot of mod podge projects, & if you're going to put wet things on the top, a few more coats of the modge podge is a good idea. Thanks for sharing. This is just so cool. 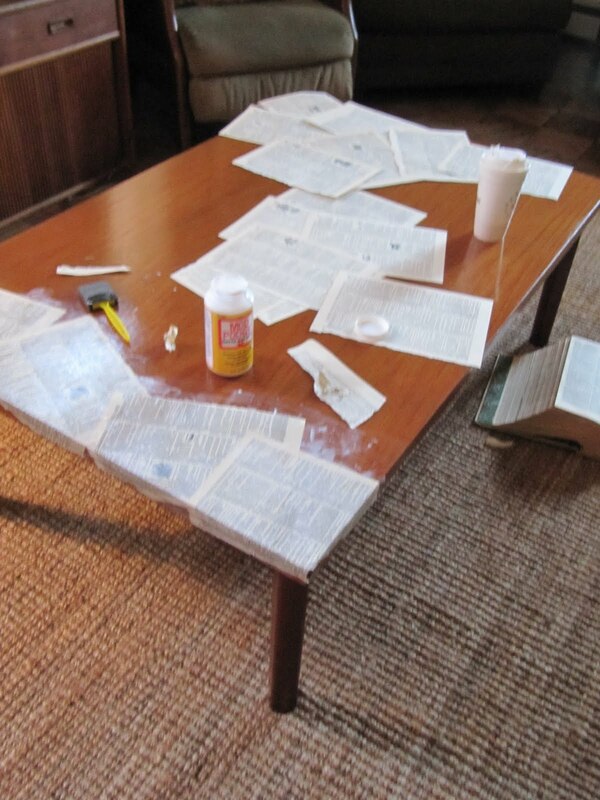 I tried to Mod Podge book pages to a desk one time and it didnt look this awesome. You have the best projects! Wondering, what if there is a spill? I would loveeee to try this out, its awesome! I am worried about clean up though! 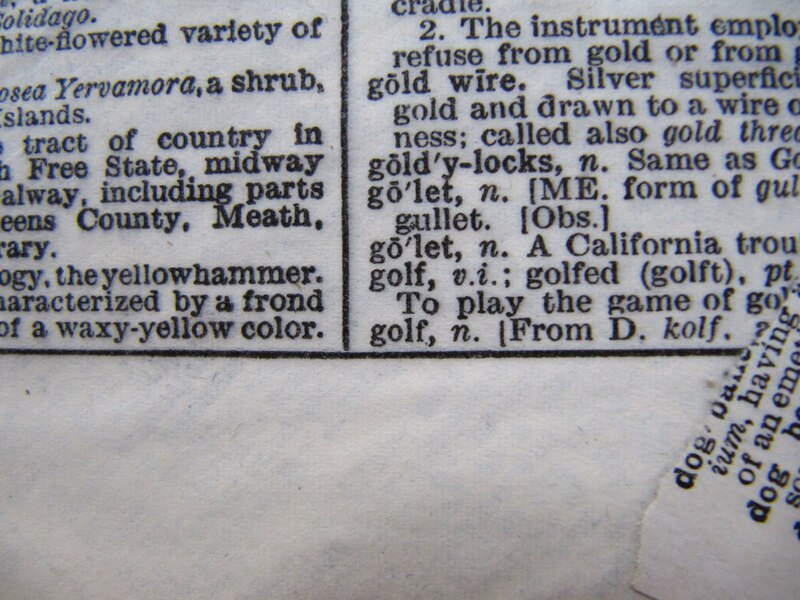 I feel sorry for my poor old dictionary. But it was fun getting to know it again.. This is awesome! I'm definitely going to have to give this a try!! This might be just the thing for our beaten down table.I'm thinking maybe vintage home and lifestyle magazines.